Figure 1. 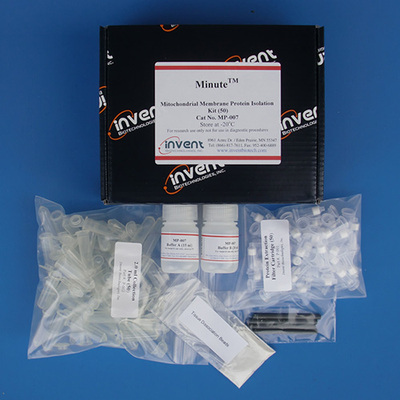 Enrichment of Mitochondrial Marker (Ubiquinol-Cytochrome C Reductase Core Protein) with MinuteTM Mitochondria Isolation Kit. A. SDS-PAGE profiles of total protein extract vs. isolated mitochondrial proteins. Lanes 1, 3 5, total proteins from isolated mouse kidney cells, mouse skeletal muscle and liver tissues respectively. Lanes 2, 4, 6, isolated mitochondrial proteins from mouse kidney cells, mouse skeletal muscle and liver tissues respectively. B. Western blotting. Proteins in A were transferred to nitrocellulose membranes and probed with anti-ubiquinol-cytochrome C reductase core protein (ab96333, abcam, Cambridge, MA) and anti-lamin B1 (ab16048,a nuclear envelope marker protein. abcam, Cambridge, MA).